Speaker Dr. Bharath Kumar addressing the doctors along with Chairperson Dr. Ubal Dhus, and Speaker and MD of Annai Arul Hospital Dr. S. Joseph Jensingh Babu on the first CME on Liver disease. Annai Arul Hospital hosted a clinical meet involving 50 consultants and the discussion was about Nonalcoholic fatty liver disease and Hepatitis B.
It’s a familiar perceptive that drinking too much of alcohol can damage the liver and a common man would consider that a person who does not consume alcohol might not get into such issues. 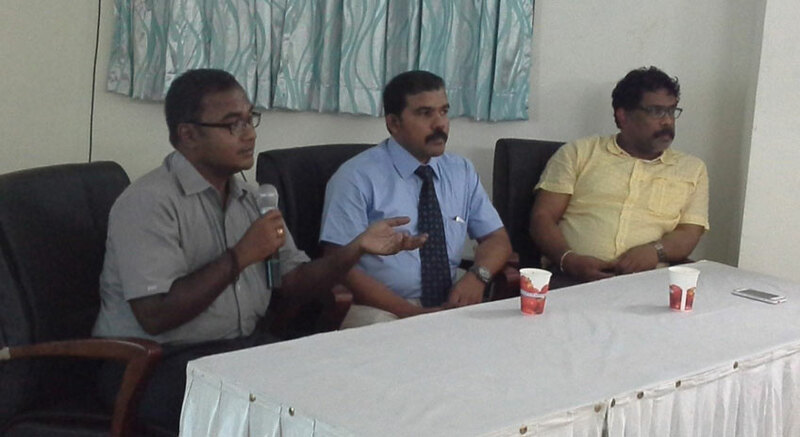 During the discussion at Annai Arul Hospital, the talk emphasized that the Nonalcoholic fatty liver disease is becoming common and for most people it causes no signs and symptoms and no complications. When the disease is detected at a later stage it becomes too late and sometimes it results in serious issue. Hepatitis B being the highly infected virus when turned acute, so it’s better to be treated at an earlier stage by vaccinating. If Hepatitis B is neglected it can result in serious liver disease or liver transplants even worse so it’s better to save one from getting infected.